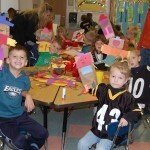 Mrs. Zurn’s kindergarten class at Conestoga Elementary participated in several different learning stations during a harvest celebration. One station had the students writing about their five senses, another station had the students making scarecrow puppets and a third station involved putting on a play. 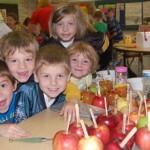 The last station had the students making caramel apples and decorating them with seasonal sprinkles.